♪ Let's all go to Dragon Land! 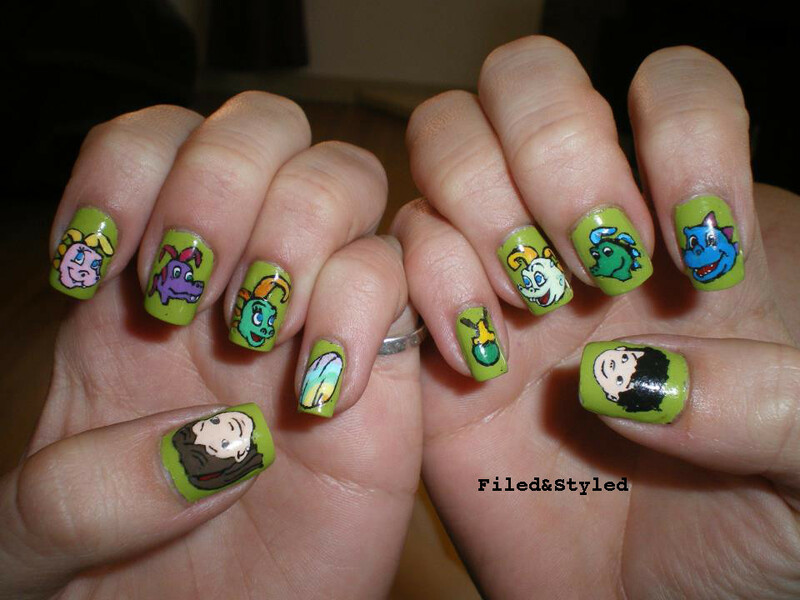 ♫ These are some of my favorite nails that I've done. I used acrylic paint and Sally Hansen Insta Dri Lickety-Split Lime. These were done in early May. I have a love-hate relationship with Sally Hansen, but lately I'm leaning toward the "love" side. I really don't like the formula of X-Treme wear, which gave me a bad taste toward all Sally Hansen products in general. That, coupled with trying the Insta Dri Anti-Chip Top Coat (which bubbled horribly for me, and I could see so many bubbles in the bottle) really made me steer clear of Sally Hansen for a while. However, I tried the Insta Dri (regular polish) and I completely love it! It dries fast, and it's affordable. It also lasts pretty long if you use a base coat, which is necessary because it does stain. Surprisingly, I even like the triangular brush. From my experience, it doesn't streak. I also really like the Complete Salon Manicure line, I've had no issues whatsoever with their formula. I'll talk about that another time. Enough talking for today! Back to the manicure. Topped with a coat of Seche Vite!